On Sept 9, 2015, I moderated a World Economic Forum panel discussion on the future of healthcare in Dalian, China. The panel drew on a wide range of expertise. With Minister Subramarian from Malaysia, Daljit Singh from the corporate world in India, Professor Thomas Insel, Director of the United States’ National Institute of Mental Health and Ron Gutman, founder of the NGO, HealthTap on the panel, the public and private sectors as well as science, academia and civil society constituencies were all represented. Here are a few reflections from the discourse. Overall, it is quite evident that the future of healthcare is being shaped by many transformative forces, which are driving change from several directions. However, channeling these to achieve health systems goals—improvements and equity in health outcomes, financial risk protection and patient satisfaction—necessitates strategic and integrated planning. A few examples are highlighted to flag this imperative. With ubiquitous computing comes the surge of ‘big data’. With co-existence of Electronic Medical Records, and population level outcome, health service and surveillance data, an important opportunity has arisen. With advanced analytical techniques, it is now possible predict events such as pandemics, behaviors and conditions. There exists a potential to refine these further with the fast-developing machines learning techniques. These capabilities can guide evidence-based decision making for improving health outcomes and can help save costs. But in order to tap this potential, governments will have to develop appropriate policy and regulatory environment and establish norms to tackle issues of confidentiality and data privacy. The power of genomics to predict individual risk and design individual treatments has huge potential to improve medical management, but in order to improve access, costs need to be rationalized. In addition, governments need to establish financing instruments, as part of approaches to Universal Health Coverage to overcome financial access barriers. Without these measures these therapeutic options will remain outside the reach of millions without health coverage. The same notion applies to many other new curative therapies. These cost-cure dilemmas need to be on the public policy agenda. As the role of personal behavior in health promotion and prevention becomes more widely recognized, smart personal digital and robotic devices will assume importance. New frontiers in research, in particular the ongoing self-directed biological transformation initiative may yield evidence which can more concretely shape the role of digital devices in enabling health promotion at a personal level rather than in general terms. While the private sector will have the incentive to play a ‘public’ role in this area, the challenge for the public sector—both national as well as global—would be to establish an enabling environment. Diet and physical activity are a case in point. Significant innovations in the domains of information communication technology and science offer new hope to create health systems solutions and thwart long standing issues, which plague health systems world-wide. Mobile money transfers for social protection, cell phone use for expanding diagnostic and therapeutic options in chronic disease management and digital solutions to improve health information quality and speed, service and supply chain transparency and effectiveness are now being tested and deployed, piecemeal all over the world. It is imperative that we generate knowledge to use these sustainably in health systems. Some solutions may well be game changing, which is why organizations such as the X-Price Foundation have pitched an award for the first team to develop a functioning tri-coder, a handheld diagnostic used in Star Trek for detecting diseases. Similar research incentives need to be adopted more widely. Even international development and public policy is massively undergoing a shift. Later this month, with the adoption of the Sustainable Development Goals at the United Nations’ General Assembly, countries will sign up to an international development agenda which spells country responsibility for development, as opposed to the era of the Millennium Development Goals, where responsibility of the aid system was implicit. Additional shifts in the global development narrative towards Universal Health Coverage and non-communicable diseases already signifies that ‘business’ will have to be conducted both differently as well as collaboratively within government systems. But it is not just governments that need to break inherent silos. Real change will come only when governments, knowledge and innovation communities, implementers and investors come together in support of solutions that are viable, sustainable and scalable and where public institutes have capacity to make the right deployments in the health system. This requires a massive shift in its own right. 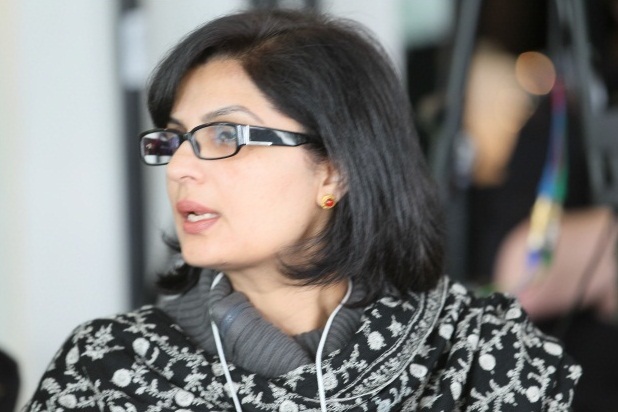 Dr. Sania Nishtar was also the facilitator at another session on “Gender parity”. Both these sessions are part of the World Economic Forum’s global transformation and challenge stream of work.